What makes a prophet a prophet? Why does Peter in Acts 3:24–26 refer to his hearers as heirs of the prophets? And what do our Old Testament readings from Numbers 12:1–9 and Deuteronomy 18:14–22 have to do with the church. Are you, this congregation, heirs of the prophets? What makes a prophet? A prophet fore-tells and tells forth God’s Word. His job is two-fold. We often think of a prophet as giving what we call prophecy, a foretelling of the future. Certainly the Old Testament prophets did that, as Peter mentions in his message in the Temple as he preaches to the crowd attracted by the formerly lame man leaping and praising God. But a prophet also forth-tells or proclaims God’s Word. That is also involved in Peter’s view of what the prophets did, and what he was doing. The miracle of healing the lame man and the sermon went hand in hand. Why did this miracle take place? What is the blessing of the one whom Peter repeatedly refers to as the Servant? Don’t make the mistake of thinking that Peter records this miracle to show you that God is going to give you whatever healing or blessing you claim. Tragically, one of America’s prominent religious exports to the third world is the health and wealth gospel—which is no gospel at all. The focus moves away from Christ and his work to the healer and his supposed miracles. Instead, Peter tells you, this miracle of healing (note that Dr. Luke describes specifically the feet and ankles that are healed) is the result of the exaltation of the Messiah. Isaiah 35 looked forward to the coming of the messianic kingdom. In it the lame would leap for joy. Peter, in effect is saying, “Look! That’s what has happened here!” This miracle, like the ones Jesus performed during his earthly ministry, are visible forms of the proclamation of the kingdom. It is a foretaste of the times of refreshing which the Servant brings about by his suffering, death, and resurrection. The kingdom Jesus established is here, ever since his resurrection and ascension. But it is also future. Times of refreshing are anticipated! “Viewed against the background of prophetic promise, these early signs of Jesus’ power to rescue and repair by his Spirit reveal that the church’s life is now a first installment and preview of the peace, purity, love, and joy of the world to come, even in the midst of the old creation’s present pollution, decay, and death.” (Dennis E. Johnson, The Message of Acts in the History of Redemption, p. 56). A prophet has religious fellowship with God. In Numbers 12 Moses had married a Cushite (Ethiopian) wife. Was this Zipporah (Exodus 2:21–the term “Cushite” can refer to Africa south of Egypt or to part of Midian), or is it a marriage to a woman from Cush, not recorded elsewhere in Scripture. In either case, this seems to be more of a presentation complaint, the heart of which was the jealousy revealed in v. 2. 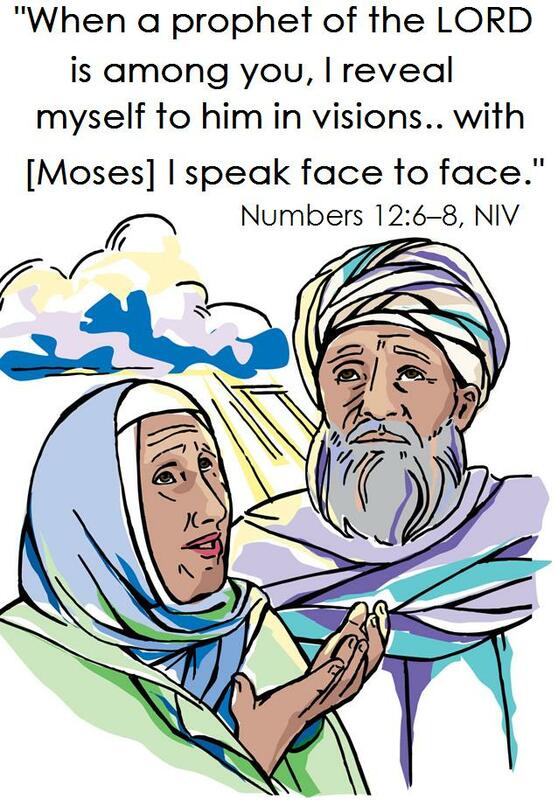 The deeper problem was Miriam and Aaron’s jealousy, which challenged the unique position of Moses. The verb in v. 1 is feminine singular, perhaps indicating that the heart of the objection came from Miriam. This may also explain why the judgment of leprosy came upon her. The underlying assumption that Moses was holding onto authority for himself should have been obviously false in view of Numbers 11:29. As the Lord rebukes them he points to the closeness of the fellowship between God and Moses. God graciously communicated with prophets. But he spoke face to face with Moses. Think of him on Mount Sinai, and particularly having the Lord reveal himself to him. A prophet not only speaks for God, he was characterized by close religious fellowship with him. “It is evident that a religious preeminence was involved. Moses, in Numbers 11:29, expressed the desire that all of God’s people might be prophets. This clearly shows that from the first there was a religious as much as a functional value found in the appearance and exercise of the office. This appraisal runs through the entire history of prophecy from beginning to end. The divine promise in Joel 2:28–32 extends it into the eschatalogical age. Not only is Israel honored by having prophets, the greater honor is that the people are intended to become prophets.” (Geerhardus Vos, Biblical Theology, p. 217). The Christ is the prophet like Moses. The Christ is the ultimate prophet. In Numbers 12:7 Moses is God’s faithful servant in God’s house. Deuteronomy 18 promises a prophet like Moses (who was truly unique in the Old Testament) but far greater. Peter identifies the Jesus, in whose name the lame man had been healed, as that greater prophet. You see the character of the work of the Messiah when Peter identifies him with the mysterious prophet like Moses. What is his importance? This miracle of healing is connected with the ultimate healing that God gives in drawing a person to himself. Peter’s message called his listeners, and Luke records it, so that the Spirit can use it to call you, to repent and turn to God. “Moses is surpassed by our Lord Jesus Christ, who did only what God commanded Him. He was not a servant in house of His Lord; He was a Son set over the house of His Father—which is also His house, for the people of God are also His people.” (S. G. De Graaf, Promise and Deliverance, Vol. 1, p. 342). Listen to him! As Messiah, Jesus has a three-fold office. Here the focus is on prophet. He is greater than Moses. Hebrews 1:1–4 contrasts the earlier revelation God gave, wonderful as it was, with his final, definitive speaking in his Son. Since God has spoken, you must listen. You must respond. Live as heirs of the prophets. The risen servant of the Lord speaks to you. Peter repeatedly refers to the Christ as the Lord’s Servant, echoing the language the Lord had used in rebuking Miriam and Aaron. Peter is making clear that although Jesus had been crucified, he had been raised. Having ascended to heaven he is still working powerfully on earth. Not just Moses, but all the prophets, from Samuel on, testify to Christ. The prophets, living in close religious communion with God, helped guide and establish the kingdom. Now the greater prophet has come, and he, by his death, resurrection, and ascension, has established the kingdom of God. And you are part of it! As the heirs of the prophets, live in covenant fellowship with God. Peter means more than that his hearers have received what Samuel and the prophets promised, true though that is. Rather, that religious fellowship, that close relationship with God, that characterized Moses especially, but also the other prophets, has now become your relationship with God. It takes place because the Servant of the Lord has come to turn you from your wicked ways to fellowship with God. His death and resurrection are yours. And thus, also, the close fellowship between the Christ and his Father is what you are called to as an heir of the prophets. Would you like to have stood in Moses’ sandals as he had his mountain top experience? As you trust in Christ you have an even closer relationship with God than he did, because, in Christ you have seen the Father. You are not just a kingdom of priests. You have become the prophets of God, living in covenant fellowship with him.